The Gokavi Transverse Technique (GTT) is a dry needling acupuncture technique which utilizes high frequency electrical stimulation to aid in the treatment and management of chronic myofascial pain release. 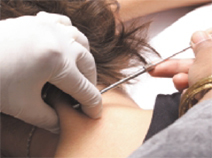 Needles are inserted in a specific transverse direction to form a special circuit enclosing the area of pain. The needles are electrically stimulated at two different high frequencies, resulting in relaxation and analgesia of the targeted muscles. The high frequency electrical stimulation activates low threshold skin and muscle receptors (mediated by the monoamine transmitters) and causes the midbrain to bypass the endorphin system. Analgesia is mediated by enkephalin which causes the release of serotonin and norepinephrine, monoamine neurotransmitters which suppress pain transmission. Dry needling is then performed transversely. The relaxed muscle (due to the prior high frequency stimulation) can then be lifted and needled through its entire thickness, releasing spasms and trigger points. The increase in muscle length increases mobility and reduces pain, and since the needling is conducted transversely the procedure is more safe than similar procedures. The analgesic effect causes an important and significant improvement in patient compliance and tolerance to the dry needling. When the procedure is performed by qualified hands, dramatic and long term effects can be expected. GTT is especially effective in the treatment of patients suffering from fibromyalgia.